SPARKS, Nev. (AP) — Federal scientists and land managers who’ve been crafting strategies to protect a ground-dwelling bird’s habitat across the American West for nearly two decades are going back to the drawing board under a new Trump administration edict to reassess existing plans condemned by ranchers, miners and energy developers. Federal officials are wrapping up a series of public meetings with three sessions starting Tuesday in Utah ahead of a Nov. 27 cutoff for comment on Interior Secretary Ryan Zinke’s order last month to consider revisions to land management amendments for the greater sage grouse that were adopted under the Obama administration. Zinke says he wants to make sure the amendments don’t harm local economies in 11 western states and allow the states to have maximum control over the efforts within their borders. Conservationists say it’s a thinly veiled attempt to allow more livestock grazing and drilling, similar to Trump’s efforts to roll back national monument designations, but on a much larger scale. They warn it could land the hen-sized bird on the endangered species list in 2020 when the U.S. Fish and Wildlife Service is scheduled to review its 2015 decision not to list it. “They appear to be dismantling the whole land-planning amendment system and starting over,” said Patrick Donnelly, the Center for Biological Diversity’s Nevada state director. 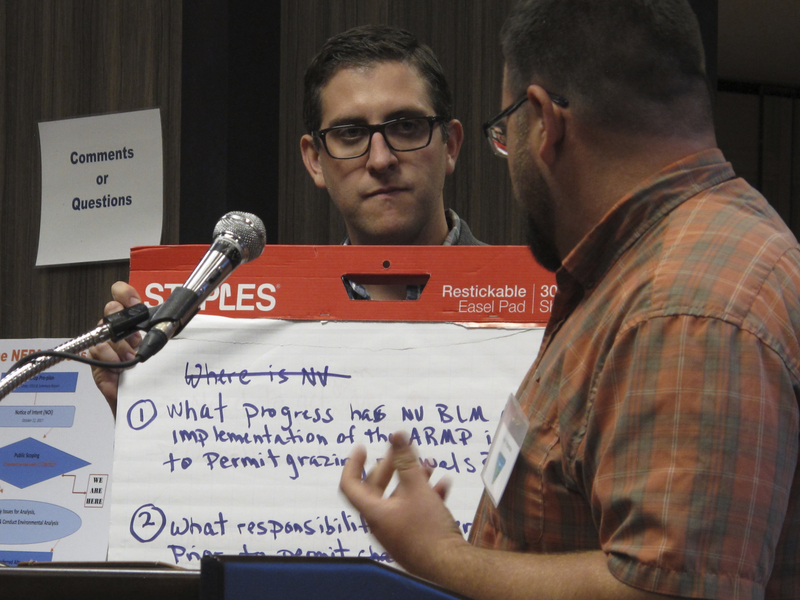 “It’s revisionist history,” he told a Fish and Wildlife Service official during a scoping meeting-turned-brainstorming session at a Sparks hotel-casino Wednesday night. They treaded familiar ground. 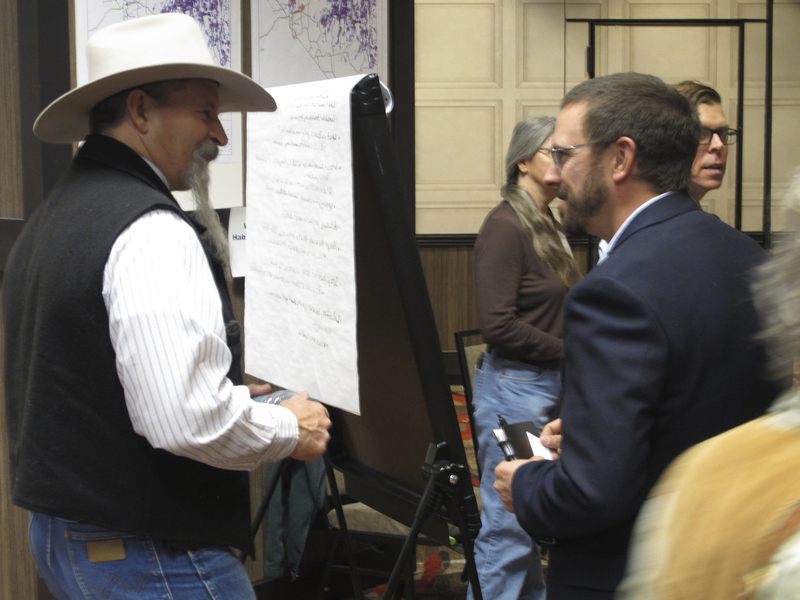 Disagreement reigned over the size of protective buffer zones around grouse breeding grounds, states’ role in setting federal policy and whether cattle or wild horses cause more habitat degradation. There was general agreement that invasive cheat grass is fueling one of the biggest threats – catastrophic wildfires – but little consensus on what to do about it. “I don’t understand why we’re starting all over again,” shouted a man who briefly disrupted the meeting and refused to provide his name. The U.S. House Natural Resources Committee heard the same thing last month from Idaho House Speaker Scott Bedke, a fifth-generation rancher who blames grazing restrictions for a wildfire that wiped out his family’s winter grazing allotment this year. “In the process of placating anti-grazing activists, federal agencies have made the No. 1 threat to the greater sage grouse in Idaho worse,” Bedke said. Idaho Gov. C.L. “Butch” Otter, a Republican, filed one of a series of lawsuits aimed at blocking the Obama plans. Conversely, Republican Gov. Matt Mead of Wyoming, Democratic Gov. John Hickenlooper of Colorado and Democratic Gov. 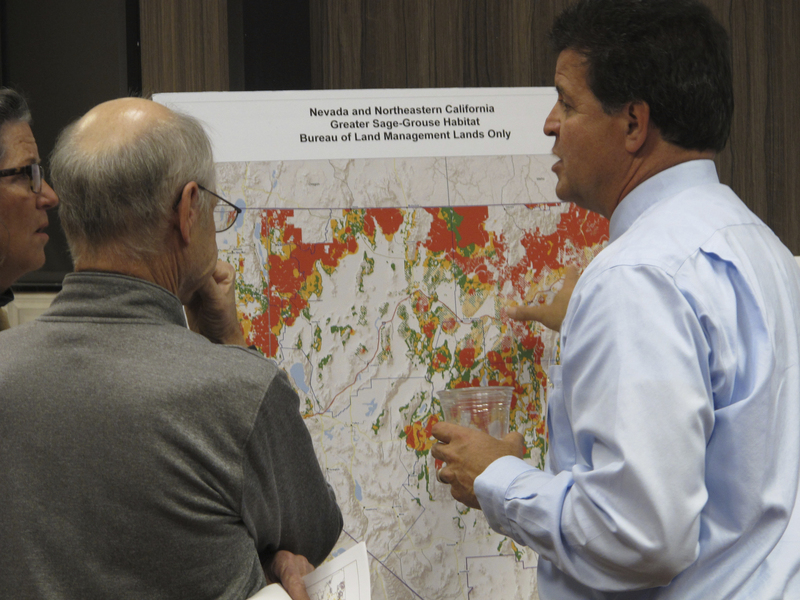 Steve Bullock of Montana have expressed concern that altering existing plans could undermine efforts to prevent a listing. Nevada GOP Gov. Brian Sandoval also has cautioned against wholesale changes, although he applauded Zinke’s recent lifting of a temporary ban on new mining claims across about 15,600 square miles (40,400 square kilometers) adopted under Obama. “Those plans were essential to keeping sage grouse from becoming endangered,” he wrote in a Nov. 7 letter to Zinke. That’s the message Karen Boeger delivered in Sparks. The bureau’s acting deputy director, John Ruhs, understands the frustration. “A lot of folks have been engaged in this topic for a long time. Some have been at the table going back 15 years or more,” said Ruhs, who’s worked for the agency in Nevada, Oregon, Colorado and Idaho. Donnelly, whose Arizona-based group has sued over failure to list hundreds of species, said the intent of the Obama amendments “was very clear: Prevent the listing of the sage grouse.” That goal seems to have gotten lost, he said. Written by SCOTT SONNER, Associated Press.